There is much talk about a knock link in the impreza and turbo charged car comunity but what it does isnt always common knowledge. The basic idea of a knocklink is to warn the driver of the car that the fuel in the pistons isn't burning at the correct time, aka incorrect detination or det. Fuel and air mixture by its very nature is not always an exact mix, because of this the speed at which the mixture burns isn't always the same, this can be a critical and very serious problem in a cylinder fireing 1000 a minute, 17 times a second, fireing at the wrong time, or incorrect pressure can seriously damage an engine or even causing engine explosions. (reports of incorect fireing/det being ten times the normal pressure have also been recorded). This det can be at its worst when the engine is under heavy load or a bad batch of fuel is put into the car (aka the ron rating isn't as high as it should be). 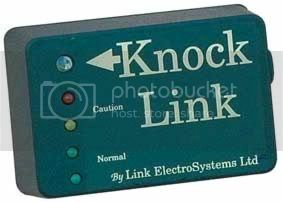 The knock link works in a very simple and basic manor, it detects each time the cylinder fires, and then by removing this background fireing noise can simply feel when a incorrect timing on the detination happens and warn the driver. Odd detinations don't regester but continual incorrect timeing lights warning light going from green, to amber to red. Last edited by skylight; 07 Nov 2006 at 09:54 AM.